“In many places in the developed world, it’s taken for granted that at the flick of a switch you can turn on a light, power your washing machine, or turn on your TV. And in most places in the developing world, people increasingly want power, and don’t want to be hostage to blackouts, if they are on a grid at all. In East Africa, Kenya’s 310MW Lake Turkana wind power project that will provide energy to one million homes is scheduled to go online this September and a 630MW geothermal plant has launched, providing electricity for 500,000 households and 300,000 small and medium-sized enterprises. In North Africa, Morocco’s Noor Complex Power Plant, the largest solar farm in the world, is anticipated to generate 580 MW to power over a million homes by the end of 2018. In West Africa, Gigawatt Global is set to develop a 100 MW ac solar PV farm in Nigeria and Israel recently signed a deal with the Economic Community of West African States (ECOWAS), for the construction of renewable energy projects worth $1 billion in 15 ECOWAS member nations, starting with 800MW of solar and wind farms in Burkina Faso, Senegal, Mali, Nigeria and Gambia. In Southern Africa, by 2013 about 46% of the energy consumed came from renewables and African Infrastructure Investment Managers (AIIM) recently acquired a majority stake in new solar and wind projects worth over 800MW. The continent has witnessed a series of funding deals led by institutional investors in decentralised energy projects. For instance, Bank of China loaned Cameroon $123 million for an off-grid solar rural electrification program that will provide power to more than 150,000 people. Meanwhile, leading off-grid energy supplier Off Grid Electric, now known as Zola, secured $55 million in Series D funding from Helios Investment Partners and General Electric Ventures earlier this year. Other large institutions like the World Bank have rolled out various decentralised energy supply programs like Lighting Africa which provides $200 million for off-grid solar to ECOWAS member nations as well as Cameroon, Central Africa Republic, Chad and Mauritania. The World Economic Forum estimates that today about 62% of the Sub-Saharan population lacks access to electricity, i.e. people who are completely disconnected from the electric grid. In addition to inadequate grid networks, electrification rates are failing to keep up with population growth, especially in rural areas, where the electrification rate is less than 25%, compared with 71% in urban areas. In rural and remote areas isolated from the grid, households typically rely on charcoal or firewood for cooking fuel and warmth in the winter, and kerosene lamps or candles for lighting. At the same time, electricity in urban areas is disproportionately expensive and unreliable due to factors such as inadequate energy supply, ageing infrastructure, and low consumer purchasing power. Consequently, many households and businesses across the continent are forced to rely on diesel generators and other supplementary sources for power. A recent study by Oil Change International pointed out that most African nations largely depend on fossil fuels and generators for energy production and that oil and gas still get the lion’s share of public financing in the African energy sector. Despite these challenges, there has been a significant proliferation of decentralised energy providers addressing energy access issues in remote Sub-Saharan areas with little to no electric grid infrastructure, in recent years. Grid infrastructure typically comprises 1) power plants; 2) transmission lines to move electricity to substations; 3) transformers and distribution lines to convey electricity to individual customers. 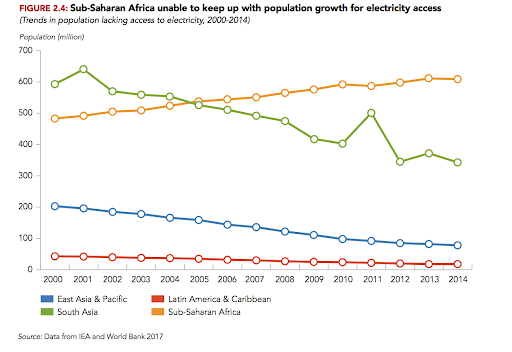 In Sub-Saharan Africa, the electric grid has expanded by way of cities growing around industries, as energy providers followed the fast-growing demand of manufacturers and urban populations. This resulted in electrification being concentrated in urban areas and peri-urban zones with high economic activity. First, grid infrastructure comes at a high cost, which most developing economies cannot afford easily. Second, a lot of energy is lost during long distance energy transmission, - e.g. on average, the transmission and distribution networks in Namibia and Kenya respectively, lose about 36% and 18% of the energy produced by power plants. Consequently, rather than investing in costly national grid expansion projects, decentralised systems have proven to be the cost-effective, go-to solution to supply energy to remote areas. Specifically, off-grid solutions are more suitable for electrifying remote and sparsely populated areas or powering high density communities that are simply isolated from the main grid. In addition, as energy providers and local governments have begun to take notice of how electrified urban households and businesses grid actually use energy, they realised that the conventional energy access measure ignores the energy reliability problem, which has significant repercussions on public health, air pollution and greenhouse gas emissions, as well as the economy. When faced with power outages, most urban households resort to firewood for cooking and most businesses use fossil-fuel generators for power. In Kenya, at least 57% of businesses rely on their own generators for power, and they cite unreliable electricity supply as one of the main barriers to business growth. According to the World Bank, power outages alone cut the gross domestic product of Sub-Saharan countries by 2%. In this scenario, small-scale off-grid and mini-grid solutions turned out to offer a viable solution for both partly electrified urban areas and rural ones. Of particular interest is the dominance of decentralised solar energy solutions in Sub-Saharan Africa. According to a recent survey by Tech Cabal, 95% of the renewable energy startups operating in Africa work solar sub-sector. Solar is especially common because Africa’s average solar potential is the highest globally, with some countries experiencing irradiation levels of up to 2000 kWh/m2/year. Gradual improvements in solar technologies and the increasing competition have also driven equipment prices down, making solar more affordable. Further, the ease of scalability of solar from small scale off-grid solutions, to mini-grids, and large scale on-grid projects, makes it an appealing energy source. Among the Sub-Saharan countries investing in solar energy, Kenya has emerged as one of the leaders in the deployment of solar off-grid solutions. Between 2000 and 2016, the population with access to energy jumped from 8% to 65% in Kenya, despite the limited electric grid capacity of about 53 installed watts/capita - as opposed to 858 watts/capita installed in South Africa. The energy affordability challenge also created an opportunity for companies such as M-KOPA - which has raised over $161 million according to Crunchbase - to provide cheap small-scale off-grid solutions through a pay-as-you-go (PAYG) business model in order to broaden the consumer base and reach the people at the bottom of the pyramid. M-KOPA offers solar home systems for an initial deposit, followed by 365 micro-payments, after which the customer obtain the ownership over the system. Similarly, Azuri Technologies sells small scale solar home systems that provide lighting for eight hours, and a mobile phone charging port. Azuri customers pay a one-time installation fee for the system and then use mobile money services to top-up their unit for about 1.5 years before they own the unit or upgrade it to a larger system. Similar to M-KOPA and Azuri, in East Africa, other companies like Lumos Global, Bboxx, and Meshpower, and Solar Off-Grid have made tremendous contributions to closing the energy access gap in various parts of Sub-Saharan Africa. In West Africa, PEG Africa, also targets the lower ends of the pyramid by offering PAYG financing and allowing consumers to access energy services without overwhelming upfront costs. The proliferation of mini-grids on the continent has also seen the establishment of the Africa Mini Grid Developers Association (AMDA), a trade association aimed at ending energy poverty in Africa. AMDA currently counts 11 members in Kenya and Tanzania including startups like Rafiki Power, Jumeme, and PowerHive and established utilities like Engie. AMDA is funded by the Shell Foundation, the World Bank and the UK Department for International Development. Although in its early stages, this trade association is an auspicious indicator of increased and more inclusive energy access in Africa. The availability of decentralised solutions paved the way to the spread of companies developing mobile solar-powered machines and tools able to provide for the absence of the national grid. Among these, many target rural areas and informal sector workers. Solar Freeze is a Kenyan startup that provides solar-powered cold storages for farmers to contrast post-harvest losses. AgSol, founded in Papua New Guinea and expanded to reach the African shores, develops solar agro-processing machines such as grain mills. Similarly, companies such as SunCulture and Future Pump use solar panels to power irrigation systems. Additionally, the availability of reliable energy through solar devices opened the market to companies such as the Ghanaian Tizeti, that provides internet access through PV-powered towers or ARED, an East African Platform as a Service company offering ‘smart business in a box’ through solar powered kiosks. Finally, building on the mobile solar kiosk models, a young Ugandan startup, Musana Carts, is developing a smart network of street food franchises that aims at tapping into the informal sector and raising the quality of their work. Musana Carts provides Kampala’s chefs on wheels with more sustainable cooking setups to their current ones by replacing charcoal fire with gas stoves and equipping them with a PV-panel which powers bulbs and mini-cold storage. Companies like Musana Carts contribute to including informal workers into the formal economy by raising the quality of their work, increasing safety - e.g. offering a supportive network around individual workers - providing reliable lighting at late hours, and increasing workable hours. Despite their success, off-grid energy suppliers still face an array of obstacles that limit their market expansion. Since they cannot tap into the resources typically available to traditional utilities, they often have to finance the development of their products, develop their own markets, distribute their units, and provide maintenance services for their systems without recovering the costs upfront. However, considering the recent deals and progress in this sector, there is hope that suppliers will be able to leverage more funding sources to help close the energy access and reliability gaps in Sub-Saharan Africa.